Marine Corps Col. George Bristol was in a key position in the U.S. Africa Command (AFRICOM) chain of command the night of the Sept. 11, 2012, attack on the U.S. consulate in Benghazi, Libya. As such, he's high on the list of people that some Republican members of Congress want to interview. But they don't know where he is and the Pentagon isn't telling. Pentagon spokesman Major Robert Firman told CBS News that the Department of Defense "cannot compel retired members to testify before Congress." "They say he's retired and they can't reach out to him," Rep. Jason Chaffetz, R-Utah, told CBS News. "That's hogwash." 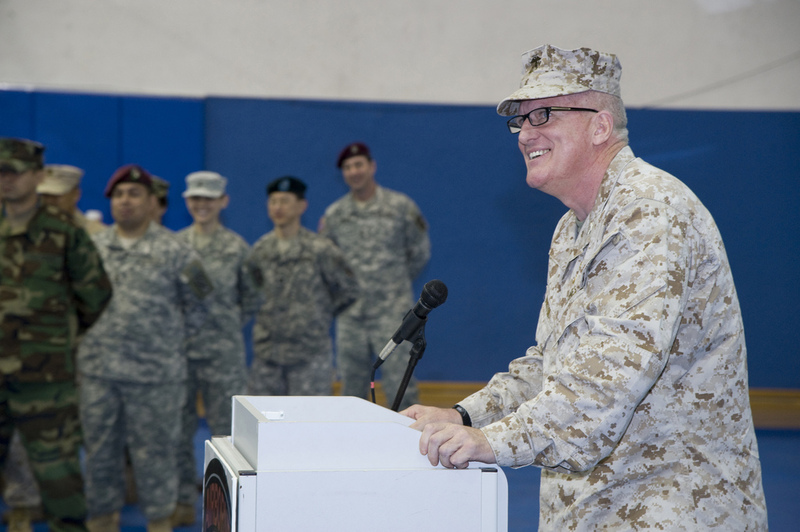 Bristol, a martial arts master, was commander of Joint Special Operations Task Force-Trans Sahara based in Stuttgart, Germany until he retired last March. In an article in Stars and Stripes, Bristol is quoted at his retirement ceremony as telling his troops that "an evil" has descended on Africa, referring to Islamic militant groups. "It is on us to stomp it out." Members of Congress in both the House and Senate, including Sen. Lindsey Graham, R-S.C., have asked the Pentagon for assistance in locating Bristol so that they can question him about events the night of the terrorist attacks in Benghazi. But those efforts have come up empty. "The Department of Defense has been entirely forthcoming on all matters related to our response to the attacks in Benghazi from the outset," said Pentagon spokesman Firman. He added that "any congressional committee can call the witnesses it needs" through subpoena, if necessary. On June 26, the House Armed Services Committee questioned other military members in the AFRICOM chain of command in a closed hearing. The witnesses included Bristol's former superiors: commander of Special Operations Command Africa Rear Adm. Brian Losey and former AFRICOM commander Gen. Carter Ham. As to why the Defense Department made Ham available but not Bristol, when Ham is also retired from his post, the Pentagon said Ham was not yet officially retired. Chaffetz says the Defense Department has actually been more responsive on Benghazi than other federal agencies, with a few exceptions including helping locate Bristol. "We will end up talking to [Bristol] at some point," said Chaffetz. "He had a very important role and we want to talk to him about it...All this raises concern when there's so much resistance to letting us speak with him." Another officer in the chain of command who was interviewed by the House Armed Services Committee in last month's closed session was Lt. Col. Michael Gibson. Gibson led a team that was on the ground in Tripoli during the attacks. A U.S. diplomat testified the team was stopped from flying to Benghazi to help the Americans who were under attack. That account differed from the Obama administration's original version of events. Administration officials contend that Gibson's team was stopped from going to Benghazi simply because it was needed more in Tripoli, and that even if it had flown to Benghazi, it wouldn't have made any difference. Four Americans including U.S. Ambassador Chris Stevens died in the attacks. Later this month, the House Oversight Committee is expected to hold a public hearing examining the State Department Accountability Review Board (ARB) probe of Benghazi. Democrats and the Obama administration praised the ARB's investigation. But Republicans criticized some of the board's efforts, including its failure to interview then-Secretary of State Hillary Clinton.